Well. That is untrue. And untrue statement. Since when don’t I have words? I always have words, as annoying or rambly or inappropriately not connected to the recipe as they are. But really today, barely any ways. They are entirely too simply, albeit costing an arm and a leg if you can find some lobster and even adding another arm and a leg if you want to do two tails per sandwich… can you say super high maintenance? A few weeks ago I asked Eddie if he would eat BLTs for dinner… and he responded with NO. Um… no? Hello. Who are you and why are you weird? He claimed they “didn’t have enough meat.” Okay. Whatevs. I skipped the BLTs that night but couldn’t get them out of my head. It’s been ages since I had one, but sometimes they just taste so freaking good you know? Yeah. He was home in like 15 minutes. Eating said BLT. 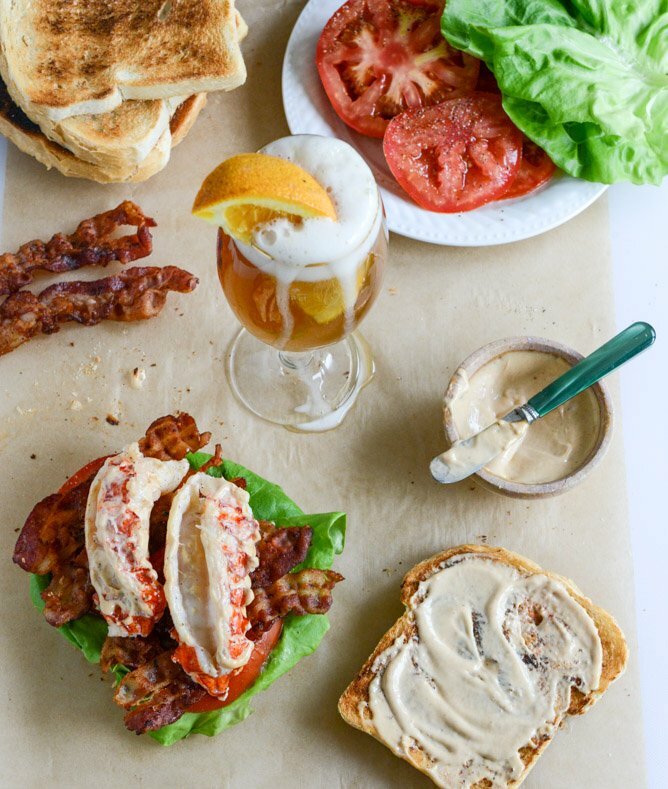 It doesn’t take a rocket scientist to throw together a BLT and I’d be lying if I didn’t say that I sorta feel like an idiot posting a “recipe” for one, but the lobster (obviously takes it over the top) and the mayo… well, I could eat that with a spoon. I’m shoving my embarrassment to the side so I can tell you about this insanity smashed between two slices of of bread. I haven’t always been a huge mayo fan. I actually didn’t eat it for years, claiming I didn’t like it – EXCEPT when it came to BLTs. I find that a mayo-y spread on a BLT is a must, and this slightly sweet and super smoky version is my new favorite. I even ate BLTs back in the day when I didn’t eat so much L and T. Granted, there was much more B than L and T, but it would still classify as a BLT. Obviously, I still prefer my B ratio to be slightly higher than the L and T. Always. And forever. Now this is what I call an ideal Monday. Pat the lobster tails dry with a paper towel. Heat a skillet over medium heat and add olive oil and butter. Once the butter is melted, add the garlic clove and then add the lobster, tossing to coat. Cook the lobster, flipping occasionally, until it is just opaque and bright red, about 4 to 5 minutes. Immedaitely assemble the the BLTs. Spread the mayo on both insides of the toast. Add the lettuce, the tomato, the bacon and the lobster tails. Serve and devour. Whisk all ingredients together until smooth. Store in a sealed container in the fridge for a few days. p.s. i’m probably going to frame that bacon photo.